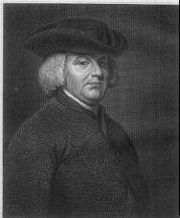 William Paley (July 1743 – May 25, 1805) was an English divine, Christian apologist, utilitarian, and philosopher. He is best remembered for his watchmaker analogy, an argument for the existence of God in his book Natural Theology. In Natural Theology Paley has adapted with consummate skill the argument which John Ray (1691) and William Derham (1711) and Bernard Nieuwentyt (1730) had already made familiar to Englishmen. The Evidences of Christianity is mainly a condensation of Bishop Douglas's Criterion and Nathanial Lardner's Credibility of the Gospel History. Paley is known for the clarity and strength of reasoning with which he expounded on the philosophy of his time, making them rationally accessible as textbooks for years to come. Born in Peterborough, Paley was educated at Giggleswick School, of which his father was the headmaster, and at Christ's College, Cambridge. He graduated in 1763 as senior wrangler, became fellow in 1766, and in 1768 tutor of his college. He lectured on Samuel Clarke, Joseph Butler, and John Locke, and also delivered a systematic course on moral philosophy, which subsequently formed the basis of his well-known treatise. The subscription controversy was then agitating the university, and Paley published an anonymous defense of a pamphlet in which Bishop Law had advocated the retrenchment and simplification of the Thirty-nine Articles; he did not, however, sign the petition (called the "Feathers" petition from being drawn up at a meeting at the Feathers tavern) for a relaxation of the terms of subscription. In 1776 Paley was presented to the rectory of Musgrave in Westmorland, supplemented at the end of the year by the vicarage of Dalston, and presently exchanged for that of Appleby. He was also a justice of the peace. In 1782 he became Archdeacon of Carlisle. At the suggestion of his friend John Law (son of Edward Law, Bishop of Carlisle and formerly his colleague at Cambridge), in 1785 Paley published his lectures, revised and enlarged, under the title of The Principles of Moral and Political Philosophy. The book at once became the ethical text-book of the University of Cambridge, and passed through 15 editions in the author's lifetime. Paley strenuously supported the abolition of the slave trade, and in 1789 wrote a paper on the subject. The Principles was followed in 1790 by his first essay in the field of Christian apologetics, Horae Paulinae, or the Truth of the Scripture History of St Paul, probably the most original of its author's works. It was followed in 1794 by the celebrated View of the Evidences of Christianity. Paley's latitudinarian views are said to have debarred him from the highest positions in the Church. But for his services in defense of the faith the bishop of London gave him a stall in St. Paul's Cathedral; the bishop of Lincoln made him subdean of that cathedral, and the bishop of Durham conferred upon him the rectory of Bishopwearmouth. During the remainder of his life his time was divided between Bishopwearmouth and Lincoln. Paley is best remembered for his contributions to Christian apologetics. In 1802 he published Natural Theology, or Evidences of the Existence and Attributes of the Deity collected from the Appearances of Nature, his last, and, in some respects, his most remarkable book. In this he described the "Watchmaker analogy," for which he is probably best known. He died on May 25, 1805. Paley sought to apply a rational argument on the grounds that reason is sufficient to answer many of the arguments of Christianity, and Paley took a position opposite from the deists in that Paley held to the point that revelation supports conclusions drawn from reason. One of the most important revelations or suppositions drawn from the Christian faith that Paley draws upon is that adequate motives must be supplied to virtue by a system of future rewards and punishments in the afterlife, an idea supplied only by the credibility of the Christian faith. The Evidences and the Horae Paulinae were intended as a demonstration of this credibility. In Natural Theology Paley has adapted with consummate skill the argument which John Ray (1691) and Derham (1711) and Bernard Nieuwentyt (1730) had already made familiar to Englishmen. A charge of wholesale plagiarism from this book was brought against Paley in the Athenaeum in 1848. Paley refers several times to Nieuwentyt, who uses the famous illustration of the watch. But the illustration is not peculiar to Nieuwentyt, and had been appropriated by many others before Paley. The germ of the idea is to be found in Cicero, De natura deorum, ii. 87 and 97 (see Hallam, Literature of Europe, ii. 385, note). In the case of a writer whose chief merit is the way in which he has worked up existing material, a general charge of plagiarism is almost irrelevant. The Evidences of Christianity is mainly a condensation of Bishop Douglas's Criterion and Nathanial Lardner's Credibility of the Gospel History. But the task is so judiciously performed that it would probably be difficult to get a more effective statement of the external evidences of Christianity than Paley has here presented. His idea of revelation depends upon the same mechanical conception of the relation of God to the world which dominates his Natural Theology; and he seeks to prove the divine origin of Christianity by isolating it from the general history of mankind, whereas later writers find their chief argument in the continuity of the process of revelation. Paley, William. The Principles of Moral and Political Philosophy. Dublin: Exshaw, 1785. All links retrieved March 18, 2015.